It's nail polish time! Today, I'm wearing Orange and Green by " Look Ever ". This is a newly Launched Product by Some Chinese Company. They Offers Various range of Cosmetic Products like nail paints, Eyeliners and Mascara . Well first off, the shade is just beautiful; it's a deep orange glossy color that looks amazing under sunlight. I had no issues with the formula and application so I am really impressed -- It has a flat applicator that makes application very easy. Also, the color gets opaque in a single coat which is rare found when it comes to Orange color but you could go for two coats if you'd like. About the drying time, Well it takes 1-2 minutes ! !The nightmare about wearing dark colors on nail is they leaves stains on nails when removed ... i am always ready to pay a few more bucks when it comes to buying a paint which just leave no spot after removing. 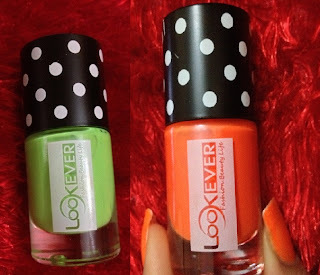 So here i found these "Look Ever" Collection ... they simply leaves u with a clean n transparent nails.